Some people either eat dinner with the television on in the background or sit on the couch with their dinner on their lap. 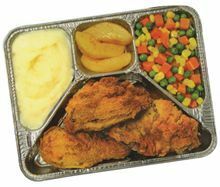 It was so popular at one point they invented a premade dinner food that came in a tray so you could eat it on your lap in front of the TV with ease. Do you eat dinner in front of the television? We don't - it's the one rule we stick to. When I was a kid, however, Friday nights we were allowed to, and I thought it was so great. No, we have a no eating in the loungeroom (which is where the tv is) rule or the kids get food everywhere. Besides, I'd rather that when we're all home we eat together as a family. No. If I do it, my kids will do it, and then we'd have a huge mess of food in the loungeroom. Best to leave that to the kitchen. I eat dinner alone three to four nights of the week because my husband is off at work, and because baby is asleep during this time I eat in front of the telly while I watch my shows. Who says multitasking can't be fun? I grew up eating in front of the TV, now my wife and I do it on rare occasions. Yes, when those TV Dinners first came out! What a novelty! Then it wore off & went back to kitchen table eating. I can't stand the TV being on in the background; annoys me to nth degree! Hate it if 'pop-in' to see someone & they don't switch the TV off! Height of bad manners! We visited my husband's cousins wife, Donjo, years ago. She had lived alone, since her husband had died. It took us a few hours to find the house. We turned up, & she was sitting in from the tv watching the tennis. We hadn't seen her for years. She left the tv on! We only stayed 45 minutes! It was so difficult talking over the tv!!! So I do know how you feel! Oh! miro_.........doesn't it drive you barmy! Good on you for only staying 45 minutes! My husband & I always eat my home cooked meals,at the dinning table, with the TV on. We do our talking during the ad breaks, when we mute the TV.